This article is about the revolution of 1789. For the one in 1830, see July Revolution. For the one in 1848, see French Revolution of 1848. The French Revolution was a revolution in France from 1789 to 1799. The French Revolution led to the end of the monarchy, and to many wars. King Louis XVI was executed in 1793. The revolution ended when Napoleon Bonaparte took power in November 1799. In 1804, he became Emperor. Before 1789, France was ruled by the nobles and the Catholic Church. The ideas of the Enlightenment were beginning to make the ordinary people want more power. They could see that the American Revolution had created a country in which the people had power, instead of a king. The government before the revolution was called the "Ancient (old) Regime". The Roman Catholic Church, which owned the most land in France, put a tax on crops called the dime (tithe) which hurt the poorest and hungriest people as they were not able to afford the tax. Ideals of Enlightenment. Many people disliked absolute rule by the royalty and the nobility. They could see that in other countries, such as in the United States, which, in this time period, had just been formed, people like them had more power over the government. They also wanted freedom of religion. The first and the second estate i.e., the Clergy and the Nobility, enjoyed all the privileges and rights but the third estate (middle class,city workers and peasants) had to pay tithes and taille (taxes paid to Church and the court). Before the Revolution, France was divided into three Estates. The First Estate was the Clergy (the church). It made up 1% of the population. The Second Estate was the Nobles, which also made up 1% of the population. The other nearly 98% of the population was in the Third Estate. Representatives of the people from all three estates together made up the Estates-General. They also wanted votes in the Estates-General to be more fair. Even though the Third Estate had many more members than the other two Estates, each Estate only had one vote in the Estates-General. The Third Estate thought this could be improved by giving members of the Estates-General a vote each. However, when they talked to the other Estates, they could not agree. Since the First and Second Estates would not listen, The Third Estate decided to break away and start their own assembly where every member would get a vote. On 10 June 1789, they started the National Assembly. The king tried to stop them by closing the Salle des États meeting room, but they met in an indoor tennis court instead. On June 20, they took the Tennis Court Oath, where they promised to work until they had created a new constitution for France. In July 1789, after the National Assembly was formed, the nobility and the king were angry with Jacques Necker, the Director-General of Finances, and they fired him. Many Parisians thought that the King was going to shut down the National Assembly. Soon, Paris was filled with riots and looting. 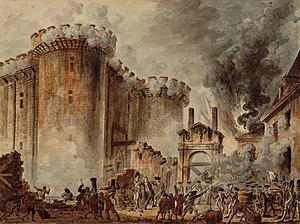 On 14 July 1789, the people decided to attack the Bastille prison. The Bastille contained weapons, as well as being a symbol of the power of the nobility and the rule of the king. By the afternoon, the people had broken into the Bastille and released the seven prisoners being held there. The royal family returns to Paris on 25 July 1791, after trying to escape. Louis XVI did not like the revolution, but did not want to get help from other countries or run away from France like the émigrés. General Bouille held the same views and wanted to help the king leave Paris. He said that he would give the King and his family help and support in his camp at Montmédy. The escape was planned for June 20, 1791. Dressed as servants, the royal family left Paris. However, their escape was not well planned, and they were arrested at Varennes on the evening of June 21. The royal family was brought back to Paris. 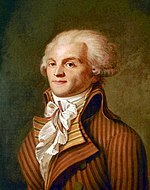 The Assembly imprisoned Louis and his wife Marie Antoinette, and suspended the king from his duty. The Legislative Assembly had about 745 members. 260 of them were “Feuillants”, or Constitutional Monarchists. 136 were Girondins and Jacobins, left-wing liberal republicans who did not want a king. The other 345 members were independent, but they voted most often with the left wing. The kings and emperors of many foreign countries were worried by the French Revolution. They did not want revolutions in their own countries. On 27 August 1791, Leopold II of the Holy Roman Empire/Austria, Frederick William II of Prussia, and Louis XVI’s brother-in-law, Charles-Philippe wrote the Declaration of Pillnitz. The Declaration asked for Louis XVI to be set free and the National Assembly to be ended. They promised that they would invade France if their requests were ignored. The Declaration was taken very seriously among the revolutionaries. In 1774, Louis 16 become the king of France. He found the treasury was empty. This page was last changed on 19 April 2019, at 06:08.